Anthropology is the study of people and their culture and includes four different branches: archaeological, biological, cultural, and linguistic. Archaeology is one of the four branches of anthropology and consists of several subtypes. The word archaeology comes from two Greek words, archaia, which means ancient things, and logos, which means theory or science, meaning archaeology is the study of all ancient things that were made or changed by humans. Archaeology in Oklahoma is an integral part of its history. There have been eight artifacts that are at least one thousand years old found around the state. Archaeology helps to answer some questions about the history of the United States. It is important to understand that paleontology is the study of prehistoric animal bones and fossils, like mammoths and dinosaurs. This is NOT archaeology. 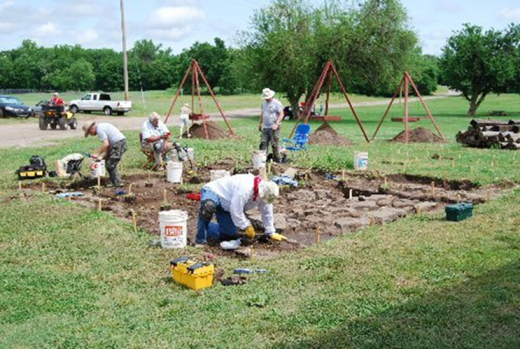 Dig site at Fort Gibson (image courtesy of Archeology Oklahoma). Join us to learn more about archaeology in Oklahoma. Look at the "Important Sites" in Oklahoma page to learn more about different influential archaeological sites in our state. The activities section has coloring sheets, games, and other activities which can be done as part of a group or on your own. There are video links to watch archaeology in action, as well as a glossary, a bibliography, and a link on each page if you are interested in more information!